Loved my experience! Fast, friendly and affordable. I dropped off my phone and was called with an update an hour later and was ready shortly thereafter. Friendly and knowledgeable staff. Very reasonable pricing. WAY cheaper than any cell phone repair shop in Jacksonville Beach. I will come back for sure! I was in town on business and needed my Blackberry (yes, Blackberry!) repaired quickly. iRepair did an excellent job in locating parts, quickly doing the repair and allowing a friend to pick up my device as I had to return home. Great service, commitment to doing it right and awesome working hours. I will send my next device (yes, another Blackberry) to them shortly for screen repair as well. Thanks! They delivered top-notch customer service with unbeatable prices!! The staff went above and beyond to meet our needs and were very friendly, helpful and fast. Overall, we were very impressed and pleased with our experience. We will definitely be returning for any future repairs! I have been to irepairfast a few times and they are very helpful. This morning I brought in my wife's laptop and they told me exactly what was wrong and that I could easily buy the replacement parts myself. They even found the parts on amazon and printed the link for me. They not only saved me money but time as well. I appreciate their honesty and will return anytime I have an issue. Just went into the store for the first time, was acknowledged by the young man in the back of the shop immediately who then came to the front and greeted me. Very personable and knowledgeable. He replaced my S5 charger door with a used one. When I have problems with any of my devices, I am definitely taking it to IRF. 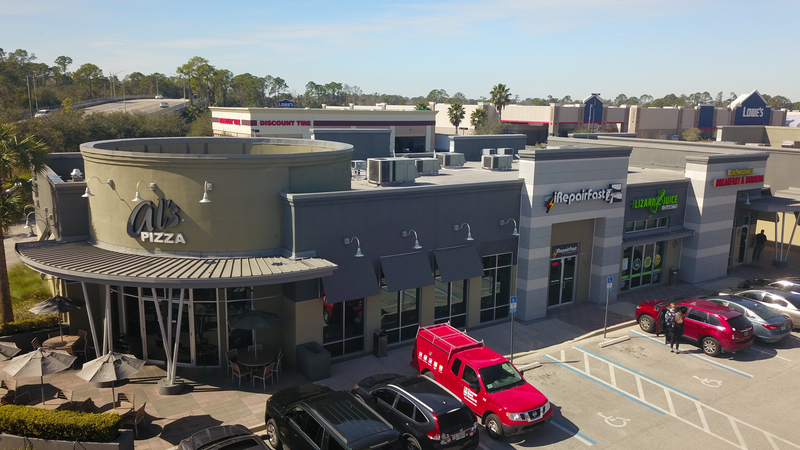 I used I Repair Fast in Ponte Vedra for the first time this week and I could not have been more impressed. The staff was extremely helpful by providing solutions to a number of problems. The staff is knowledgeable and professional and provided detailed information to me that was easily understood. I definitely recommend I Repair Fast in Ponte Vedra for solutions to electronic problems of any type. Can't say enough good abt this place! Went in with an audio mic problem to a computer store and they used their knowledge and fixed it regardless. Just seem like cool guys who know so much abt computers and tech and it's great to see! Their desk person that was there was extremely helpful then their mac specialist came in and they worked together and completely fixed my problem. Def gonna recommend to anyone w tech issues. Repairs to my computer were completed very quickly by David at the Ponte Vedra Beach store. I highly recommend using this store for any of your computer needs. Very friendly and professional. David, thank you and the staff for giving our community great service. Couldn't have been nicer! Took my computer & tested. Called me quickly to tell me I needed a new monitor. When I went to pick up my computer, i assumed there would be a diagnostic charge. I was pleasantly surprised when i was told it didn't require alot of their time so no charge to me! This was my second experience with this store & I have been super pleased. Fast service. Excellent prices. Very customer service oriented honest and upfront about options. Absolutely will go back for future repair needs and would recommend iFast to anyone in need of their own repairs. Overall highly impressed with this store. iRepairFast has always had my electronics fixed super fast and at great/fair prices. As "connected" as we are as a society, breaks and other issues with all of our devices are inevitable. I will be bringing mine back to iRepairFast whenever they do occur. And thanks to David for excellent customer service!! 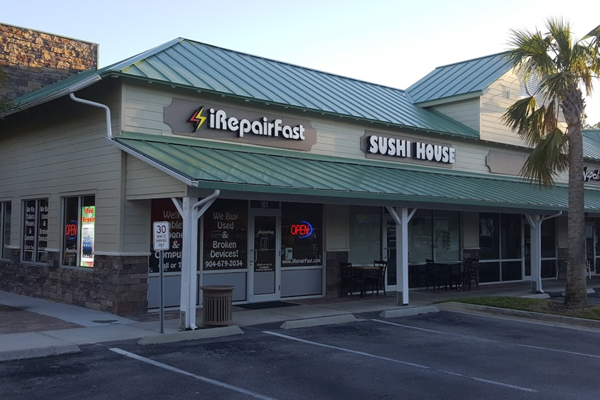 I was utterly impressed by the speedy service and the professional and courteous customer service that I was provided by the staff at iRepairFast. They were all very friendly, explained the process to me, and had my iPad repaired and back to me within a day. I can't thank them enough for saving me from having to buy another one. I will MOST DEFINITELY recommend them to all my friends and family, and I am now a loyal customer! I was having an issue with the charge port on my iPhone, and believed it needed to be replaced. Scott took my phone, checked it out and told me it was just dirty and he would clean it out and send me on my way. Five minutes later, I asked him to please charge me something for his time, effort and honestly, to which he politely refused. He could have easily replaced my port or not and charged me the full fee and I would have been none the wiser, having an honest technical repair shop is similar to finding an honest mechanic - Scott and the staff at iRepair Ponte Vedra are the best and why I have and will continue to patronize their store. Every time that I've gone here, I've had a great experience! I've been here for an iPhone screen replacement multiple times and they are fast and have great customer service. They even took one of my moms electronic halloween decorations and fixed it for free! I highly recommend them! When I first walked in I see someone leave who has only been there but a few minutes and he already has his phone fixed and ready to go and the price he was gave was really low so I already was Impressed. Shortly after he quickly fixed up my phone and was told I could go and it was free. The person who works here is David and he's kind, honest and will give you a good price. If you need something fixed this is definitely the place to go! Excellent customer service! Looked at my device instantly and although it was not fixable, I was given an honest overview of the issue and told that it would be less expensive to replace it on my own than have this one repaired. And all of this was free of charge!! This is what GREAT customer service looks like! I went in to have a stylus removed from a Galaxy Note 5 which was inserted backwards. They were able to fix it without taking the phone apart and didn't even charge me for any labor. I will be using them for any cell needs and recommending them! I ordered an iPhone 5 full screen assembly online. It arrived in 2 days, very professionally packaged: included screen assembly, tools, and extra screen protector. In the order email, they included a repair video. Took old screen off, put new screen on, reset up phone, made first call, played around with different screens- done! Looks like a brand new phone. I would use this company again. My Contacts disappeared from view on my old MacBook Air. David knew immediately what was wrong, fixed it, and showed me what he did. No charge.He didn't even know that I had been it before to have my iPhone and MacBook Air repaired. These guys are good! And extremely helpful. I’ve brought my laptop and several phones for repair and have been extremely impressed. They explain repair options and pricing very clearly. They try to help get the repair you need at the fairest price. Very honest and quick turnaround. Highly recommend. So friendly and helpful, I cannot believe how they saved my life this weekend. My headset plug broke off in my iPhone port. They performed magic surgery and got the small metal part of the plug out of the port for me within twenty minutes and between customers and made my phone operable again. I cannot thank them enough and nightly recommend them to anyone!! They always show up on time, and get it right the first time. We'll be repeat customers again.Update: And as predicted, we've been repeat customers several times. The most recent was when our VCR (yes, we collect antique tech) jammed, holding hostage our video of our daughter's 2nd birthday party. iRepairFast as usual came through, gently saving the tape and the VCR. They have always done excellent work on our printers, desktops, laptops, faxes, you name it. They are amazingly quick with scheduling at-home or office visits, show up promptly, and always have useful tips on getting more out of your computers. I enthusiastically recommend them. I went in right before close and my iPhone was not charging. He looked at my phone, figure out what was wrong with it and fixed it for free! Very nice and thorough with my iPhone. Saved me a lot of money and much easier than going to the town center. Thank you! Mike and Dave did a fantastic job repairing our dead, gray screen computer. With deliberate diligence, they worked through the disk, the board, the ribbon cable, and the software until they found the problem and fixed it. At nearly each step they called to keep me informed of the repair's progress. Thank you for the GREAT work and professionalism. Being a baby boomer and having had an admin assistant the last 20 years of working and/or an IT staff available to fix whatever the admin asst was unable to repair, i remain ignorant on computer repairs. After being locked out by google for still using micro office 2010, i brought my laptop into to IRepairFast for assistance. The front desk technician, Drew, was extremely courteous and quick to bypass the google issue and I was set to go and on the road in 10 minutes. Drew was great to work with and i highly recommend this business to all. Many thanks for such efficient service. Dennis W.
My 4 year old Macbook was constantly doing the spinney wheel. I'm in the middle of getting my degree, all online and was starting to freak! These guys were kind, empathetic and got me up in running in 2 days. My computer is running faster then it did when it was brand new!! Thank you guys so very much!!! Tonight I stopped in with a new laptop that just wasn't performing up to par. They took a look on the spot and quickly diagnosed the issue .. At no charge to me since their advice was to send it back as there was a motherboard problem.I was expecting to leave it and end up spending some bucks but these guys were super helpful immediately and the service was gratis. When does that ever happen?? Give these guys your business! This morning I forgot my iPhone was in my pocket when I waded in the ocean to retrieve a tennis ball. My shorts were soaked and it was some time before I remembered my phone. I immediately went over to the shop. David saved my phone and cleaned it. He reported no damage and no charge. I am so grateful this shop opens in Palm Valley from 8am-9pm. What a great feeling it is to be able to trust a shop with my computer, data, and phone. Thanks Guys!! I went with my mom who needed her phone repaired. The top corner was crushed by a hand weight and the display no longer worked. They not only worked a miracle on her phone, they were so kind. They fully explained what they were going to do, what the outcome would be and the timing. Her phone was fixed like new and it was such a great experience. This is my second time I used the repair service at this location. Three years ago I brought my cracked I-Pad to another dealer. I was told that it could not be fixed but they could sell me one of theirs. When I brought it to this location they informed me that it could be repaired and it was repaired in a timely manner. A couple of day ago, I brought in my crushed screen cell phone. It was barely working. I just knew that I would have to replace it. However, I remembered the miraculous job they provided for me in the pass. They informed me that it could be repaired. My phone got repaired and looks new. The workers were professional, courteous, efficient and effective in the service they provided. THANK YOU Mike and Jacob for your concern, consideration and the cord I needed for my computer that I thought was broken and needed repaired. Amazing experience with iRepairFast. I broke my new iPhone screen today. I walked into the iRepairFast Ponte Vedra branch to see if they would be able to repair the screen faster than the Apple Store, who was quoting 5 business days. To my great surprise, the iRepairFast guys were able to replace my screen in a whopping 30 minutes!!! And had an option to upgrade to tempered glass! The employees were very professional and courteous! I live in Alabama and have had an external drive that's needed repair for quite some time now (I've been really hesitant letting just anyone back home look at it) but when I came to visit my parents, I brought it and they were so quick to suggest I take it nowhere else than iRepairFast in Ponte Vedra. Within five minutes of me walking in, I left with a new casing for my drive, and before anything was done, everything was explained to me very clearly, including what I had done to mess it up (oops), how to avoid it in the future, and they even gave me the option to just recover my data without replacing or repairing the drive. I'm so impressed by the friendly knowledgable staff and will wait until I visit again if I ever need something looked at again. Thanks so much, iRepairFast! Sent my "dead" iPod touch in by priority mail because I couldn't get there. Got a call from David the day after they received it. He said it wasn't dead but clogged up with my pocket gunk. No charge. Wow! Like a mechanic, he could have told me anything and I would have had to believe him. This is how I run my business and I'm glad to see someone else who does the right thing just because it's the right thing. I wish more companies were run like this! David was incredibly helpful to me....a severely technically-challenged middle-aged woman! He was patient and thorough and he spent over an hour with me explaining everything he did to free up space on my laptop. I am incredibly grateful to him and the staff at iRepair. I highly recommend them and will use them again! 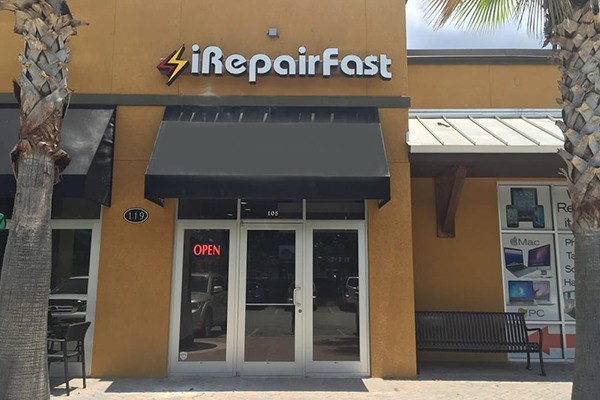 If anyone needs help with any computer problems I HIGHLY recommend iRepairFast, 3787 Palm Valley RD, Ponte Vedra. I needed help solving a compatibility issue with my laptop and an external hard drive. Wasn't even sure if iRepairFast provided software help but thought I'd take a chance and I'm so glad I did. I walked in to IRepairFast and within minutes the technician (wish I would have gotten his name because he was so helpful) solved the problem! Amazing is all I can say ~ great customer service still exists! Thank you iRepairFast!!! Love this business! Came in needing my laptop screen replaced. The price was reasonable, I put down a payment for the part, and when it came in, they replaced it same day. This place is great, and I would recommend to anyone else that needed repairs on their devices! I sold an iphone here several years ago for market price. Came back last week with my 6s with a twitchy charging port. They explained what the cost of a charging port replacement would be, but also they went in the back and cleaned it out free of charge. Phone takes a charge now, but if the port completely stops working, this is where I'll go for the fix! On 2/23, I brought my phone in because the screen was black. The technician (from Fruit Cove) looked at the phone and said it looks like it needs a new screen. I asked how much it cost to fix, he looked under neath the counter as if looking at pricing at said it will be $100 cash. He said do you need a screen protector? I said that I did but the stores protectors were too expensive. He replied, I will give you one for $10. I said I will take two! He said it should be ready in 30 minutes. I said $120 cash in total? I thought it odd but I looked on the counter and saw a sign that said cash accepted. He didn't provide me with a receipt or any other proof that he had my phone. Which I thought odd as before they were very strict on showing proof. When I returned a man in front received a receipt for his iPhone 8 request. The man behind the counter was putting the screen protector on when I came to the counter. I handed him the $120 and asked for a receipt and he said the printer wasn't working? I wondered how they will know that I just had the screen replaced. He said it will be in my file. I called later in the week and the employee "Toby" said yes I see you were here and the cost was $60... then I went to the store and the manager said, no I see you paid $85. I asked the Mgr to find out what happened. I said I don't know if the screen was even replaced. I said I just want the $100 refunded. It has been three weeks and no one has responded or provided an explanation on subjective costs. Beware. Their customer service is fantastic! They were so nice and helpful both on the phone and in the store! Something had wiped out my hard drive on my laptop. They recovered it and all my favorites in about 24 hours! Their prices are reasonable as well! I highly recommend them for computer and electronic device services! I plan to use them again in the future if I have any problems! I was referred there by another friend who had a great experience. I went in with my CPU after contacting them with the issue and questions. I was treated with the utmost respect and professionalism. After a quick evaluation I was contacted the same day with the info on what needed to be done and cost. Dylan is who I dealt with and he is very knowledgeable and does not try to sell or talk you into more than you need. They are very honest and customer friendly. They take the time to explain everything and do not get frustrated or impatient with you with all the questions and inquiries. Also it is a local and veteran owned business who makes sure the customer is treated with respect. I have already referred other friends and coworkers who need tech worked done. I had the pleasure of meeting the owner who is definitely customer oriented and has a team who follow his example. I will continue going to them for all my computer and other related electronic issues. I have been a regular customer of iRepairFast for the past 3 years. Their service is reliable, the staff is extremely knowledgeable and courteous and the value is outstanding. I have come to touch iRepair as our go-to facility for all electronics repairs and service needs. Please support them and they will not let you down! And remember, they do much more than replacing phone batteries and screens. The staff is proficient with all computer issues - repairs, back ups, and services. I love this place! They saved my tablet when I thought it was a goner. They were able to figure out what was wrong with the charging port and had it fixed really quick. Definitely recommend anybody to go here. The staff is so nice and they know what they're doing and they don't overcharge. iRepairFast is the best place you could possibly find for service and repairs. The techs are awesome, quick turn-around...can't recommend them highly enough .... they've saved my devices more than once!! Check it out .... you won't regret it. I will never go anywhere other than iRepairFast for my electronics repair. I had a very unique situation and they were FAST (as advertised), fair and very honest. I was thoroughly impressed and they've earned a customer for life! Can’t make it to a local store? Check out our ship in service!